Three years on from when I first found out about these little crusties, and things are starting to move along. First of all, Nick Mott – my contact at the Staffordshire Wildlife Trust – has put together a booklet, and (flatteringly) asked if he could use my photos. You can find a copy of the booklet on the SBAP website library. Secondly, there’s been a bit of a change of management at Dosthill Quarry, and the owner – Ian Forster – has started up a new project called Underwater Ecosystems – so we can hopefully more emphasis on conservation education at his sites. Finally, I dropped into Stoney Cove a couple of weeks ago, and found a few of the little chaps. As strobes upset them, I tried to get some available light shots – this is the best one of the bunch. I’ve seen them there in the past, but always had a wide-angle lens (which isn’t really ideal). This was taken with the Zuiko 14-54 Mk.II. 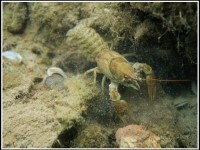 This entry was posted on Wednesday, August 5th, 2009 at 12:20 am	and is filed under White-clawed Crayfish. You can follow any responses to this entry through the RSS 2.0 feed. You can leave a response, or trackback from your own site.